“Introducing Biblical Interpretation” is a video-based course on hermenuetics (how to study and interpret the Bible) by Logos Bible Software. In my first post I looked at the layout and overall format of the Logos Mobile Ed courses, as well as giving a brief overview of the purpose and content of this particular course (You can read that review by clicking here). My second post on “Introducing Biblical Interpretation” focused on the content of the first half of this course, noting its strengths and weaknesses (You can read that review by clicking here). This post, my third and final review of this product, will focus on the content of the second half of this course. In the last half of “Introducing Biblical Interpretation,” Dr. Michael S. Heiser focuses on three important areas: literary context; linguistic context; and application. 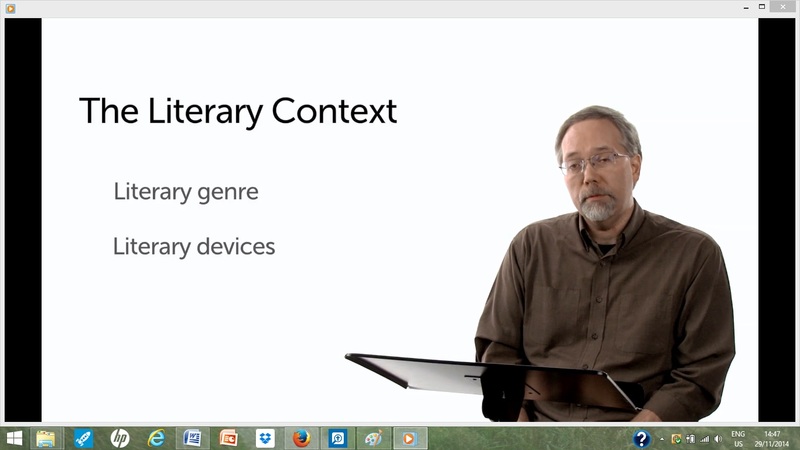 The discussion of literary context is by far the longest section of the course, comprising 53 videos. Dr. Heiser divides his teaching on literary context into two broad categories: 1) a discussion on genre, and the various genres that can be found in Scripture; and, 2) a discussion of literary devices or techniques used by biblical authors. Introducing Biblical Interpretation by Dr. Michael S. Heiser from Logos Bible Software. Click here to purchase this product. Because of the length of this section, it is not possible to summarize everything it contains. 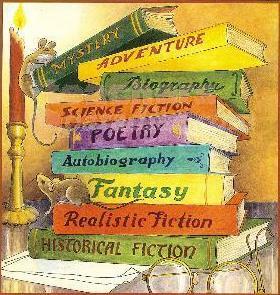 I will simply note a few of the literary genres and devices that Dr. Heiser talks about and what can be learned from these insights. Heiser argues that it is impossible to know what words mean without an understanding of genre. He illustrates this by the word “descent.” “Descent” has multiple meanings and only by knowing the genre can we discern what is meant by it. For example, the meaning of “descent” differs depending on whether the genre is a genealogy, a landscape plan, or a flight manual. Heiser follows his discussion of knowing the genre by introducing the controversial topic of what it means to interpret the Bible literally. This is an important topic that he returns to later in the course. I will reserve further comment on this idea because I wish to devote a future post to exploring this subject. The discussion of what is literal versus what is figurative, or even, what do we mean by a “literal interpretation” of Scripture, is a key hermeneutical issue and I am glad to see Heiser tackle it. Knowing the genre is important! Some of the various genres explored include, Old and New Testament Narrative, genealogies, various types of psalms, genres peculiar to prophetic literature such as the lawsuit or funeral dirge, epistles, and apocalyptic. Heiser spends a lot of time examining prophecy and apocalyptic in both the Old and New Testaments and explaining the differences between the two. This is helpful because these two genres are often confused or, at least, conflated. He differentiates between predictive prophecy and preaching using the usual categories of “forthtelling” (preaching) and “foretelling” (prediction). Heiser emphasizes that about 80% of prophecy is preaching to the contemporary situation the prophet finds himself in. He also discourages placing our own meaning on symbols used by the prophets. It is important that the ancient meaning of the symbols and what it would have meant to the writer, audience, or prophet be the determining factor. Heiser also argues that prophecy can have more than a “one to one fulfillment.” This means that, although a passage might be applied to Jesus, or the new covenant, within the New Testament, it might also have a more immediate fulfillment in the prophet’s own time. He uses Amos 9:10-12 as an example, noting its Old Testament context and its use in Acts 15:12-17 where James (the speaker) and Luke (the author) put a different spin on it. He argues for “Sensus Plenior” which means that although a passage might have a certain meaning within its original Old Testament context, it can take on a “fuller meaning.” This is because God may see something that we in our finiteness may not. Other possible uses of Old Testament passages include analogical (a situation is similar to a past event), or typological (when a person, event, or thing foreshadows something in the future). Although I am in agreement with Heiser, some theological traditions would disagree with some of his conclusions (e.g., some would argue there is only one fulfillment of a prophecy). However, he does an admirable job illustrating his conclusions from Scripture. This section of the course includes discussions on such devices as chiasm (mirror imaging), gematria (the use of numbers to communicate a message), hyperbole, metaphor, poetic parallelism, typology, as well as others. For those who are not familiar with these ideas, this section will prove to be very informative. For example, Heiser gives two examples of chiastic structures and explains the significance of this literary device. He shows how the story of the Tower of Babel (Gen. 11:1-9) is laid out in a mirror image, and also how the Book of Matthew can be similarly viewed. 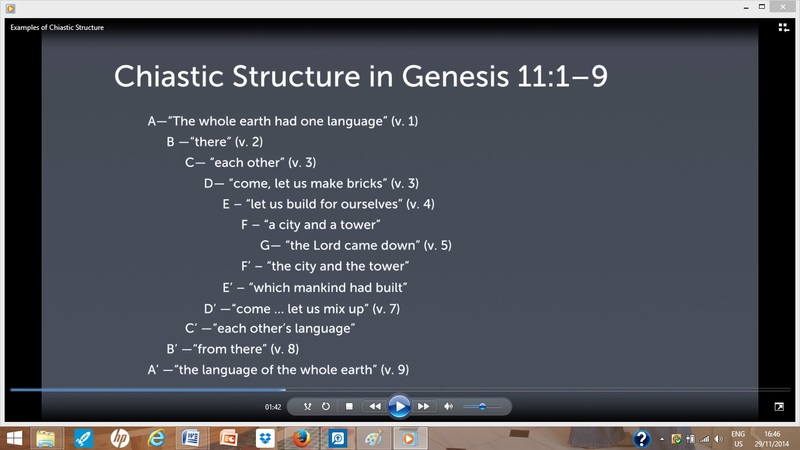 The picture below illustrates the chiastic structure of the story of the Tower of Babel. Notice how the ends of the story use similar wording, all working toward the middle of the story where “the Lord comes down” which is the turning point of the story. Chiastic structures occur frequently in Scripture and recognizing them can aid biblical interpretation. Most of us who have read Revelation are familiar with the use of gematria in Revelation 13 where the number 666 stands for the anti-Christ. Heiser points out another possible use of gematria in John 1:32 where the Spirit descends as a dove at Jesus’ baptism. In Greek the numerical value of the word “dove” is 801 which is the total numerical value of the Greek alphabet. It is suggested that the use of “dove” here may be a way of referring to Jesus as “the Alpha and Omega” (the first and last letters of the Greek alphabet). Another, more controversial proposal by Heiser, is that gematria may explain some of the large numbers used in the Old Testament regarding populations and armies. While some maintain the numbers should be taken literally, others argue that geography, ancient sociology, and archaeology do not support some of the large numbers (e.g., 2-3 million Israelites leaving Egypt and wandering in the wilderness) used in the Old Testament. The argument does not dispute inspiration, but suggests that the numbers must have another significance other than just literal, and Heiser suggests that gematria may perhaps be one possible explanation. Understanding language, including syntax and grammar is essential to biblical interpretation. Unit 5 of “Introducing Biblical Interpretation” concerns understanding words and syntax. Heiser mentions this is where some often begin their Bible study. Using concordances or Lexicons to do word studies is important, but he maintains that a word, in and of itself, has no meaning. He argues, and rightly so in my opinion, that without knowledge of the social context (Unit 3 in this course) and the literary context (Unit 4, just discussed), it is impossible to know what a word means. Heiser states, “If you can’t understand what a person thinks, how can you understand what they wrote?” He illustrates this by using the word “run.” By itself the word “run” has no meaning. “Context is King” as Heiser says. Is “run” a noun or verb? Actually it is both, but only context will tell you which. Furthermore, the word “run” when used as a noun has 12 different meanings, while “run” used as a verb has 50 meanings! Although this unit addresses a very important subject for Bible study, its primary value is for the Logos owner and user. I found this unit extremely helpful in teaching me things about doing word studies, or syntax studies in Logos that I never knew before. I will certainly return to the videos in this section again and again. However, if a teacher wanted to use the videos in this unit to teach a class about linguistics and they were not Logos users, then most of the instruction here would not be very helpful (but see my comments in the next paragraph below). Among the topics covered (again there are too many to mention them all) are: detecting the form of a word (in the original language); determining relationships between words; detecting the semantic range; and understanding and analyzing at the word level. Heiser ends unit 5 with a helpful discussion on the differences between manuscripts of the Bible. There are, however, some videos in this section that anyone would find helpful, including those without Logos. One brief segnment contains a further discussion on the use of scholarly commentaries. Here Heiser returns to a subject explored earlier in the course (the use and value of commentaries) and demonstrates how scholarly commentaries are helpful in providing word and syntax insights. Heiser also ends this section with a very helpful discussion about differences in ancient manuscripts. For the person who struggles with why there are so many English versions, or which one is the best, or asks, why they differ, or why some English translations have footnotes that give an alternate reading or leave out a passage entirely, these 4 videos provide a helpful foundation for answering such questions. I found two minor errors in the second half of this course. The first occurs when Heiser is discussing the New Testament’s use of the Old. As noted above, he argues for “Sensus Plenior” (a passage may be shown to have a “fuller” meaning in the NT). When discussing Acts 13:34-35 he notes that this is a quote from Psalm 16:10. Throughout the rest of the discussion, however, he constantly refers to this reference as Psalm 22. The screen has the correct reference and the written copy also has the correct reference, so hopefully the listener will realize that Heiser keeps accidentally mentioning the wrong Psalm. A second error occurs when Heiser is talking about ancient biblical manuscripts. 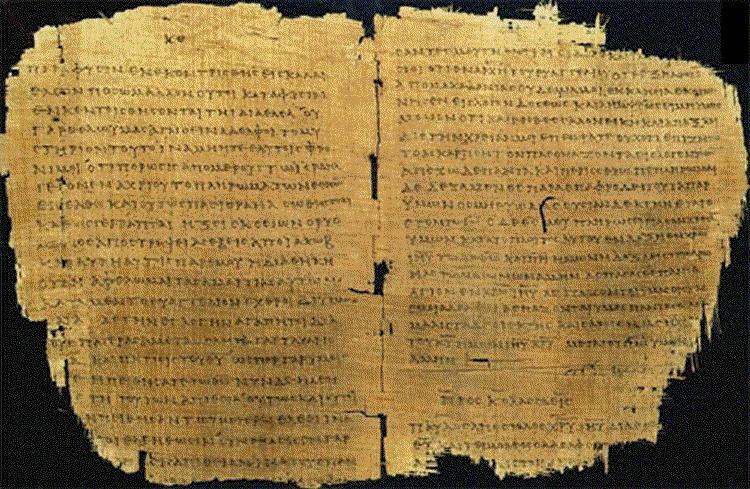 As he is informing his listeners about the oldest complete copies of the Septuagint (Greek Old Testament), he notes that they are from the 4th century. This is correct, but he then states that they date to around 550 A.D. which is incorrect. In fact, the 4th century refers to the 300s not the 500s, and the correct date is around 350 A.D. for these manuscripts. This mistake of 200 years is also found in the written copy. These are minor issues, but they are inaccuracies worth noting in case Logos is able to correct these mistakes in the future. 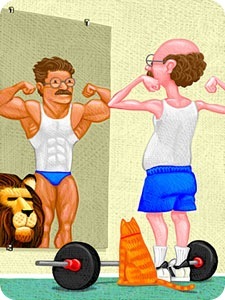 There are many strengths to the second half of the course. Perhaps the greatest is the indepth treatment of various biblical genres and literary devices. In my opinion, there is a wealth of information here that acts as a great introduction for someone beginning more serious Bible study. I am also happy to report that a majority of the Logos resources recommended under “Further reading,” were also available to me. In my review of the first half of this course (review #2 in this series), I noted that I did not have access to a lot of the recommended reading material. The reverse was true for the second half of the course, so this was a welcome change. Again, the availability of the recommended reading material will depend on what version of Logos you have. 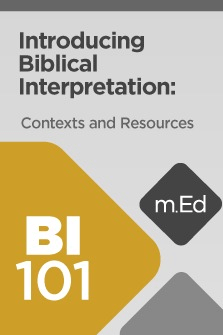 Overall this is a very fine course on biblical interpretation. Heiser knows his subject well and presents it in a clear but relaxed style. I know that I will come back again and again to some of the videos in this series and I heartily recommend it to others. To check out the Logos Mobile Ed course, “Introducing Biblical Interpretation: Contexts and Resources,” click anywhere on this link.